The Nephite war with the Amlicites is graphically illustrated on this map. The Amlicites journeyed southwest near the city of Amnihu and met the Nephites at the Hill Amnihu, across the river Sidon, where they were defeated (see Alma 2:15–18). They retreated past Gideon to the land of Minon and there regrouped and joined forces with the Lamanites, on the road to the land of Nephi, before marching toward Zarahemla (see Alma 2:20, 24). The Nephites, alerted of this attack, cut short their pursuit and returned to protect the city of Zarahemla (see Alma 2:25–26). They met the Amlicites and Lamanites at the ford of the river Sidon and again defeated them after a bloody battle (see Alma 2:27–34). The Nephites pursued the invaders out of the land into the wilderness of Hermounts (see Alma 2:35–38). 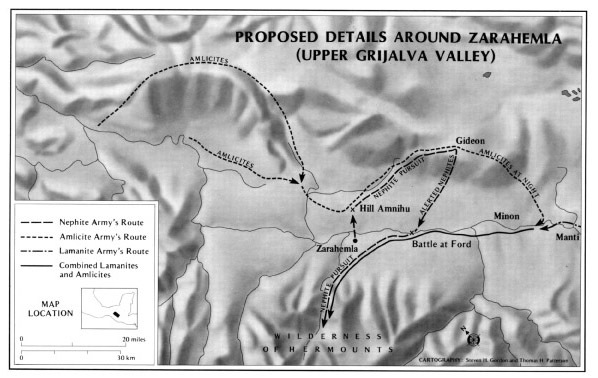 The city of Zarahemla, the hub of Nephite government and commerce, is shown here against the topography of the Upper Grijalva Valley. The ancient ruins that correspond best with Zarahemla, called Santa Rosa, are now underwater and cannot be studied in depth; however, what we do know about Santa Rosa is enough to see similarities between it and the city of Zarahemla. Interestingly, Santa Rosa had a dual linguistic and social history, showing that two distinct groups of people most likely lived there. This corresponds with the people of Nephi and the people of Zarahemla under the leadership of Mosiah. Although Santa Rosa cannot be confirmed as Zarahemla, it is an interesting possibility.